We were lucky to be able to test the new Marker Alpinist AT bindings this spring. 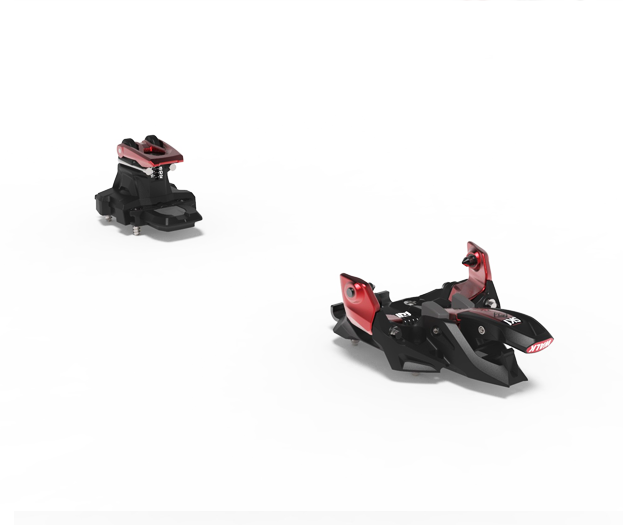 On paper the spec (DIN up to 9 or 12 depending on version, recoil spring 15mm, 3 mounting positions, toe-piece with anti-ice polymer, 38mm screw spacing for mounting on wide skis, weight only 490g a pair without ski brakes, recommended price 329.95 €, optional ski brakes available in three widths: 90mm, 105mm, 115mm), the Alpinist does not offer any revolutionary design innovations, but has an ergonomic strpped-down design and a very competitive weight / price ratio. Step in is easy, if not the best for this category of bindings. To shave weight Marker have used a flexible elastomer to make the “towers” that help position the boot. These weigh less than the metal equivalents but are a bit soft, so don’t do the job quite as well as a real tower guide as used on the Dynafit Speed Radicals, for example. On the ascent changing between climbing modes is easy and the three climbing heel positions are well designed, with a choice of flat, a low "race" position with a 5° ramp which covers the inserts without turning the heel unit, while turning the heel unit gives the 3rd high position with 9° ramp. In use the “race” position will be used most and the simplicity of using this without having to turn the heel unit is well thought out. 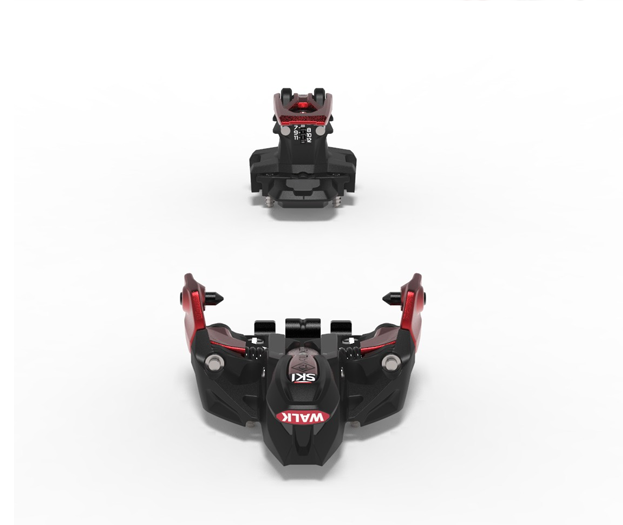 If you’ll be using ski brakes then swapping between ski and walk modes takes a little longer but is simple and easy. Moving from walk to ski mode is achieved by pulling the lever at the back of the heel unit to deploy the ski brakes. You do need to remove boots from the bindings to easily swap between modes but in practice this is not an issue - most skiers will be doing this anyway to remove or add skins. The ski brakes seemed a bit flimsy and on our test skis seemed to have suffered some abuse, while the connecting wires to the heel pad are very thin and looked fragile and easily damaged with careless use. To see with time. Ski crampons are available four widths, 80, 90, 105 and 120 mm. 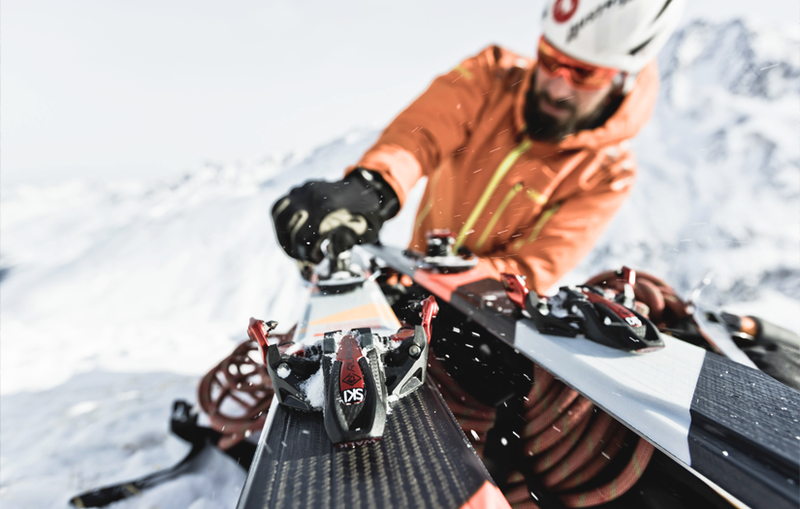 Attaching them to the skis is easy, using the same attachment method as the industry standard Dynafit crampons, sliding into the crampon slot from the side. On the descent the bindings work well, skiing well and the relatively strong springs in the toe piece avoid premature release, letting you ski hard with confidence. The Alpinist heel unit features a small shock absorbing recoil spring mechanism allowing the tour to travel on the base plate and absorb pressure as the ski flexes. Binding manufacturers have spent a lot of effort extolling the virtues of these systems for improving skiability and release reliability. However on the Alpinist the range of movement is minimal at only 4 mm compared to compared to at least 10 mm for the Kingpin, Atomic Shift, Fritschi Tecton or the Dynafit Radical / Rotation bindings and looks more like a marketing ploy than a useful feature. Sometimes a heel support pad to stabilise the boot position will do a better job than a recoil spring (Plum Pika for example) and can be a better choice than having a “minimalist” recoil spring but without heel support (ATK Raider 12 for example). We think it’s more important to consider the whole ski / boot / binding system than include minimal recoil springs with too limited movement, especially since the Alpinist does not have the TUV standard. Bindings with such limited recoil do not offer sufficient margin to absorb the flex of the ski in all situations and could result in the heel unit backing up against the boot heel, pushing the boot forward. For everyday use the main advantage of this small recoil spring is that it makes binding adjustment for the boots easier since the boot heel sits flush with the heel units, with no need for the 4mm space which can be a source of error. The Alpinist is produced with a choice of two lateral release ranges. For lighter skiers the Alpinist 9 has a lateral release range of 4-9 DIN while for stronger or heavier skiers the Alpinist 12 has 6-12 DIN. Both versions come supplied with the same fixed vertical release 8 DIN springs. Like many Race/Efficient category bindings, the Alpinist has one piece “U” springs to save weight rather than the more sophisticated separate “pins” used on heavier bindings. The bindings come supplied with “U” springs with 8 DIN stiffness (which seemed already very solid) while “U” springs with 6 or 10 DIN for lighter or heavier/aggressive skiers are available as optional extras. Heel units with U springs do require more vigilance in the long run because they wear out faster than the independent pins as used on the Dynafit Speed ​​Radical, Plum Guide, for example. Keep an eye on these, especially if you’ll be using these bindings for mixed touring / resort use. The Marker Alpinist is aimed at a wide range of ski touring skiers and is light, easy to use and can fit ski brakes. We see this binding however as targeting the traditional touring market than as a lightweight “free tour” binding. Marker have obviously wanted to produce a competitor for the very popular Dynafit Speed Radical and it is both lighter and cheaper, but with a less sophisticated heel unit than the Speed Radical. This season we’ll be able to test the Alpinist’s durability, already proven at Dynafit, and if good the Alpinist could quickly become very popular. Materials: Forged aluminium, carbon, fibre-reinforced polyamide. K2 is back in the game with their new lightweight alpine ski boots which were well received this winter. For next winter 19/20 K2 have developed the new Mindbender range, solid free-rando boots that let you tour the backcountry and that perform on the downhill. K2 have updated the iconic Wayback and Talkback touring series for this winter. The Sick Day series has been successfully updated for this winter. I found the old Sick Days a little lost in the middle of the Line-up, so to speak, being less playful than the Pollard ski but offering less pure performance than the titanal reinforced Supernaturals.